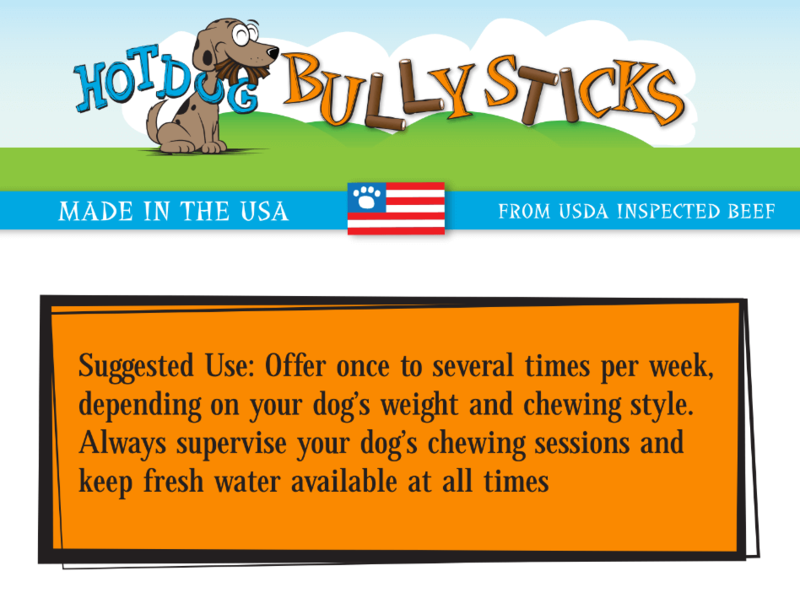 Introducing bully sticks from a brand you trust, Hot Dog Collars! Our Hot Dog Bully Sticks are Angus or Angus/Herford crossed cattle that are 29 MONTHS old or younger. All USDA inspected beef are raised within a 500 mile radius of Omaha, Nebraska. So they are 100% USA born, raised, harvested. The sticks take only 2 weeks from processing to our shelves, meaning freshness you can count on and a 24 month shelf life. Our bull pizzle is slow cooked & roasted at 209 Degrees for 30-33 hours and then hand trimmed. Even better, they are processed in a GFSI (Global Food Safety Initiative) certified facility. This third party BRC audit certification. means the facility meets all the health and safety requirements to produce human grade foods. MADE IN THE USA - USDA inspected Angus/Herford cattle. You can feel safe knowing your dog is enjoying only the finest US sourced product. Why take a chance on cheaper overseas bully sticks? Where inspection and food regulations can be lacking or even non-existent! Joker the Whippet gives this product a 5 Paw rating. The sticks arrived on time, they are made in the US (a requirement), and they are long lasting. Yum!!! I received the bully sticks when Hot Dog said they would arrive. They are reasonably priced compared to competitors and USA produced. I do not eat anything from outside the US. I immediately sampled them upon their arrival and they are delicious! these are good treats, but I made an order here on jan 11. inquired about not received item, on 19th, told due to a holiday I had to wait until the 20,called on the 20th and only got recording of elevator music for 45 min+. sent in a computer request for refund, there reply was I had to wait until mon the 23rd, well I talked to them then, and promised , but still no help, so do you really want to buy here? I'm 45.95 in the hole and must use paypal for ref.